So anyway, I took a week off from Zap2it to recharge my batteries. Actually, I had a bunch of goals, but the need to watch live-but-not-really coverage of the Olympics put a kibosh on much of that. But yeah, the goal was battery recharging. Somehow, in my warped version of "recharging," I decided it might be fun to drive off into the desert for a couple days. And in my warped version of "recharging," "drive off into the desert" became a couple days in Vegas. Given that I'm typing this at 12:15 a.m. because I needed to cool off from The Strip (it's still around 85 degrees out), but I still intend to go back to some casino or another tonight... Not so much with the recharging. A few general and introductory thoughts after the bump, should you care... I'm not sure I've had enough to drink for them to be amusing. Travel Time: Last time I drove to Vegas, for my buddy Ezra's Bachelor Party, I was actually a passenger and the trip out took roughly seven hours, perhaps a smidge more. This time, door-to-door, I did the trip in 4:05, which includes a stop in Primm to get an energy drink. That's how long trips to Vegas should take, at least if you aren't flying. 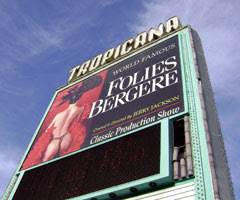 You Get What You Pay For: My room at the Tropicana cost only $40 a night. Bless mid-week, August rates. Then again, my room is practically on the strip, I can't modify the temperature, the sofa has no springs and the bed is sortta caving in on itself. I opted to save $10 bucks a night rather than bumping up to The Tower at the Tropicana, which I know to be less skuzzy, albeit only slightly. 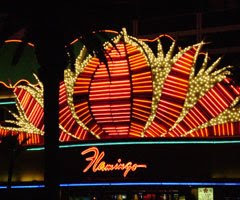 The Tropicana has a smidge of that Old Vegas charm, but the fact that Sammy Davis Jr. got laid on my coach doesn't necessarily inspire the requisite nostalgic shivers, at least not out of me. All will be forgiven, though, if I can have a huge alcoholic beverage by the pool while reading the fourth book in the "Twilight" series. Ugh. Totally shouldn't have admitted that, right? Americans Don't Go to Vegas Mid-Week: I've decided that *every* person in Vegas on a Wednesday night is Hungarian. Why Hungarian? Because listening in on conversations is like the hospital interrogation in "The Usual Suspects." Almost none of what I'm hearing makes sense, but I swear everybody keeps saying "Kaiser Soze!" God Bless The Tackiness: Has the fountain at the Bellagio always used "God Bless the USA" as one of its swaying tunes? If so, I hadn't realized previously. If not, you haven't lived till you've heard jingoistic patriotism synchronized to a fountain in front of an Italian-themed casino next to an Ancient Roman-themed casino across the street from a Paris-themed casino. The Hooters Casino: Because I opted for the El Cheaper accommodations, my hotel room is actually closer to the Hooters Casino than to the Tropicana floor. So tonight, after walking from one end of The Strip to the other, losing about $5 bucks per casino, I ended up, at least for an hour, in the Hooters Casino, which is EVERYTHING you would imagine it to be. Yeah, it's a little sad and desperate (even by Vegas standards), but I walked into the Casino with $31 in my pocket and after that hour, I walked out with $31.50. HUZZAH! I think you should try chatting up the Hungarians, particularly the women. Hey, you never know. And I want to hear more about the buffets, man! I can't believe you made it all the way to Breaking Dawn. I just read Twilight (after hearing about all the buzz, and being a vampire mythology lover and a lover of all things teen, I figured the series was right up my alley) and I could barely make it all the way through the book. Does the series get better? Or at least to a "so bad it's good" point? Even though I hated the book, I still want to see the movie. I don't quite understand that logic, but hey. I never claimed what happens in my brain makes any sense. I could not finish _Twilight_ Bk 1, and you're on Bk 4? (?!) I don't know what to say. You are more tolerant of teen pap - on paper and TV, I guess.